OMEGA's FSV-ADV high quality, price competitive systems offer a cost-effective means of removing condensate from compressors, receivers, after coolers, filters, drip legs and dryers. Each is supplied standard with a 1.8 m (6') heavy duty cable with grounded 115 Vac plug and strainer ball valve. 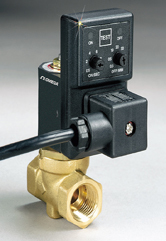 The TEST button allows manual override to confirm valve on/off function. 참고: Comes complete with strainer ball valve and operator’s manual.